"Sampath Speaking" - the thoughts of an Insurer from Thiruvallikkeni: Quick brown fox jumps over ~ rare black fox sighted in UK !! Quick brown fox jumps over ~ rare black fox sighted in UK !! Dear (s) : Can you say which one of the following is correct ? Could be a difficult one for the new gen. But for old timers, this is a well known sentence. Away, Foxes are small-to-medium-sized, omnivorous mammals belonging to several genera of the family Canidae. Foxes are slightly smaller than a medium-size domestic dog, with a flattened skull, upright triangular ears, a pointed, slightly upturned snout, and a long bushy tail. Foxes live on every continent except Antarctica. The global distribution of foxes, together with their widespread reputation for cunning, has contributed to their prominence in popular culture and folklore in many societies around the world. The hunting of foxes with packs of hounds, long an established pursuit in Europe, especially in the British Isles, was exported by European settlers to various parts of the New World. They are generally brownish ~ and rarely all black !! MailOnline reports that a driver was shocked to find one of the UK's rarest animals, the elusive black fox, had jumped into his van as he was loading up one day. Sam Houghton couldn't believe his eyes when the fox tried to clamber aboard his vehicle in Sale, Greater Manchester. The black colouring is common on growing fox cubs before they grow their dark chestnut coat. The rare black fox was spotted in Sale, Greater Manchester; some red foxes stick with their beautiful black fur because of a rare genetic glitch. To make that happen, both parents have to carry the rarer recessive melanic gene - that causes a black coat - but even then there is only a 1 in 4 chance of having a cub with a dark coat. The man is quoted as saying that as they were loading up, the black fox came from nowhere and tried to jump into the van, taking them by surprise and scaring them too ! 'We were amazed when we saw it. We googled it and it was definitely a black fox. I couldn't believe it when it said it was one of the rarest animals in the UK.' They got their composure and were able to photo the rare animal. 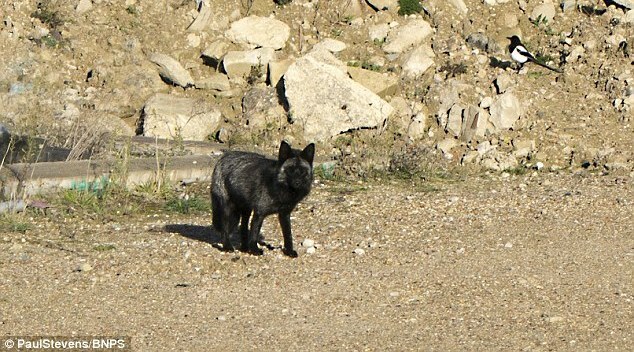 A flurry of black fox sightings this year have given hope that they may be breeding. Five black foxes were spotted in Yorkshire this year which has led to claims that there may be a breeding pair in the county. It was thought the foxes spotted might be descendants of the famous 'Black Fox Bob' - only the fifth black fox confirmed sighting - who sadly died in Halifax last year. 'It is also possible that the appearance of melanism in UK foxes is natural and it is topography and inbreeding that is keeping the gene expressed in small communities. 'Melanistic animals are naturally bolder than their non melanistic counterparts, and now breeding season is over and weaning is about to begin it may be that the fox just felt the need to take advantage of what peoples gardens had to offer.' Before this year, there had only been five reported sightings of black foxes nationwide in five years. They are the rarest animal in Britain, partly because they were extensively hunted for their fur in the past. In Gaelic tradition, black foxes are bringers of bad luck and in Medieval times, villages were afraid of seeing one, believing it was an omen of trouble or bad luck. Now to the opening ~ ‘pangram’ contains all the alphabets and would help test out the new typewriters. The word ‘pangram’ comes from Greek, literal translation meaning every letter. The pangram at the start of the article is believed to have been in use for centuries and utilised by Western Union to test Telex / data communication equipment for accuracy and reliability. Number of computer programmes including MS Windows use this to display the available fonts. Of the two, the latter is not a pangram, as it does not have a ‘s’ in the sentence. Fox News is an American basic cable and satellite television news channel owned by the Fox Entertainment Group, a subsidiary of 21st Century Fox. The channel broadcasts primarily from studios at 1211 Avenue of the Americas, New York City, New York. The channel was created by Australian-American media mogul Rupert Murdoch and was launched in Oct 1996.